Since my post, 30 Frugal Meal Ideas (for when you’re broke) has been so popular I decided to make another list of the most frugal and relatively healthy foods that money can buy. 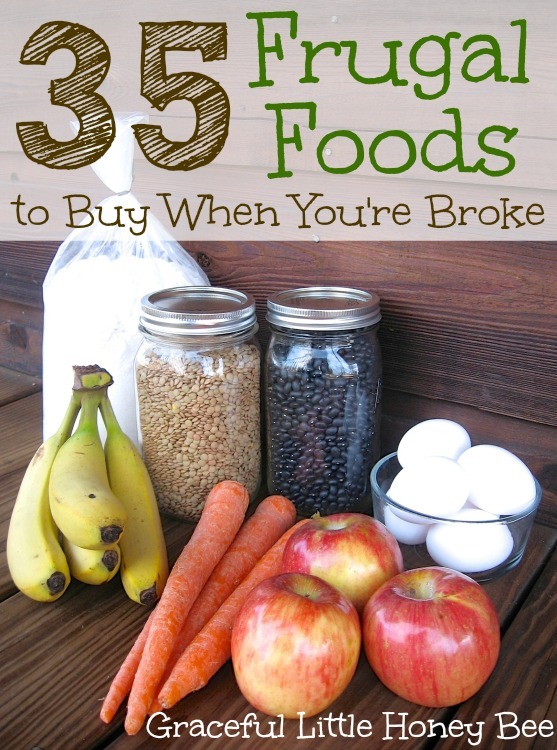 You don’t have to be broke to eat these foods, in fact my family eats them all the time because I like to keep our grocery bill low. Basically every item on this list can be found for around $2 or less per pound. I hope to show people you can stay within your budget while still enjoying a healthy and varied diet. Also, you should be able to find additional in season produce for this price all year round such as citrus fruits in the winter, berries in the summer and sweet potatoes in the fall that are not on the list. Do you buy these foods on the regular basis? What would you add to the list? I’d love to know! Great list! Thank you for sharing! I would add baking powder,baking soda , and yeast to the list. A lot of recipes call for that. I would agree to an all purpose baking mix but, not a pancake mix. You can make pancakes with basic pantry ingredients anyway. I definitely second the Masa! But for the meats I would say look at what's the cheapest that week. My recent grocery trip had whole chicken legs on sale for $1.79 a pound which was the cheapest option. Also I recommend frozen vegetables. They last longer than fresh, taste better than canned, and are easy to throw into boiling pasta to have a quick healthy dinner. When I was newly married. I made a plan to cook from scratch for my husband to impress him. Needless to say...I ended up with more reasons to cook from scratch. My oldest was allergic to tree nuts( most plants are processing tree nuts) After a while I noticed processed food has way too much salt in it! I like the flavor of spices, garlic ECT. A lot of what you shared is what I like to keep on hand. I would like to add celery to the list. You can make a real good chicken noodle soup with the potatoes, carrots, celery, onions and chicken. Don't forget to add your choice of spices from the spice cabinet. Hi there! I am a busy mom of 3 looking to save on groceries while the kids are out of school this summer. This list will help for sure. You have a lovely blog by the way! This is a nice list, I typically eat this way when traveling and I am no the road, specially in expensive cities. Thanks for sharing. Great list! Another thing I would add is to make and keep up a sourdough starter--then dry some of it and store the dried starter in the pantry. That way, we can always have delicious fresh bread using only salt, flour, and water. No need to buy expensive packets of dry yeast that always seems to expire before you use the third one. This is our grocery list when we have money. I came to find out what to buy when we are broke. We have $150 to feed 6 people (4 adults and 2 children) for the month. Can not get food stamps, can not collect unemployment. I would add sweet potatoes which are so versatile and inexpensive! Also, stewed tomatoes are great to have on hand for crockpot meals! I would add Canned Tomatoes. My family loves veggies and salads, so I would add iceberg lettuce, celery, and radishes. Celery is so good in soup and also makes a great snack with peanut butter. I love this. Yes, I just made my list and I'm not quite finished so ill need to add some I'm seeing here and they're great ideas I didn't think of old lentils and whole wheat pasta and tomato sauce. And I would add Coffee. Also even though I'm only buying for myself, I'm trying to buy all in bulk. So I'm buying in as big as I can that I can assume I may consume in 6 months. And getting enough containers suitable to store the goods so I don't waste it and lose money. Meat in focusing on Beef and Pork as my Chickens and Turkeys are in freezer. Might get anything if on sale cheap enough. But I like buying White Basmati Rice in huge sacks and having it stored away forever. Never run out. And same with beans. And pasta and I even have Hard Red Wheat in freezer and I cook that up and eat like oatmeal or Rice pudding.